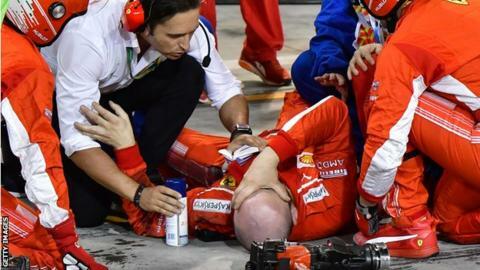 Ferrari mechanic Francesco Cigorini suffered a broken leg when he was run over by Kimi Raikkonen during a pit stop in the Bahrain Grand Prix. Ferrari's pit system showed a green light to Raikkonen, indicating he could exit the pits, despite mechanics not having changed his left rear wheel. Cigorini suffered a fracture of the tibia and fibula in his left leg and was taken to hospital. The incident forced Raikkonen's retirement from third place because it is forbidden to return to the track with tyres of different compounds on the car. Ferrari have declined to say what went wrong to cause their pit system to trigger the green light until governing body the FIA has completed its investigation into the incident. The team will want to know what caused the normal fail-safes that all teams have built into their procedures to be overridden in the circumstances of the stop. Ferrari driver Sebastian Vettel won the race to take a 17-point championship lead over Mercedes driver Lewis Hamilton but said the incident had left "mixed feelings". Cigorini posted a message from his hospital bed saying: "Surgery ok. I have to thank all the people worried for me. Nothing else, just a big thanks. Hugs!" "If one guy is getting injured, it is bad for us," he said, after briefly delaying his mandatory television interviews to ask the team about Cigorini's condition, for which he had to ask for permission from a representative of F1 management. In a statement released by Ferrari later on Sunday, Raikkonen is quoted as saying: "What happened to our guy Francesco today at the pit-stop is very unfortunate. I feel sorry for him and hope he's going to be OK soon. "It's always a bad thing when someone gets injured but I am sure he has the best people taking good care of him and I wish him a speedy recovery. As for the accident itself, all I know is that I moved when I saw the green light go on. "I couldn't have possibly realised that there was an issue with the rear left wheel, then I saw someone had got hurt and, immediately, I was told to stop by the team. Unfortunately something must have gone wrong and we'll need to find out what. "The car had good speed today but I had some wheelspin at the start. Anyway, there's not much I can do now but wait for the next race, where we'll try to do our best."